Ask a layman for an example of a martial art, and he's likely to point you towards the nearest karate dojo. After all, the martial arts, as we all know from the movies and TV, are traditional fighting systems from Asia. Against colorful and fanciful tales of men who can kill with a single punch and swords that can cut through machine gun barrels, systems of personal combat indigenous to Western culture tend to be downplayed as mere competitive sports and children's games–-neglecting, of course, that competition also weighs heavily in the minds of practitioners of many Asian-derived arts. Don't fencing, boxing, and wrestling have as much history, color, and even spiritual depth as kendo, karate, and judo? And, if so, why doesn't anybody remember this "lost history"? Enter German-born Christoph Amberger, descending upon the scene with pen in hand and a Wagnerian score in the background. Amberger's The Secret History of the Sword ("SHOTS") aims to set the record straight on the matter of Western martial history and traditions. Though his qualifications are those of a historian, not an instructor, Amberger is still eminently qualified to write such a book. Besides being broadly educated and possessed of top-notch research skills, he also bears on his face the marks of several "mensur", or ritual duels fought with live blades between members of certain German student fraternities. Thus, whereas he may be a bit lacking as far as championship trophies go, Amberger has almost unimpeachable credibility so far as the combative mindset goes. After all, he paid for the knowledge with his own blood. This lack of teaching credential in no way mars his work, though, for "SHOTS" can not properly be called a technical manual detailing a complete fighting system. Rather, it is an omnibus, a martial history as erudite as it is varied, and which serves to introduce the reader to the rich history of Western martial arts. In many ways, though, this is the bookís biggest drawback, as well as its greatest strength. "SHOTS" originally began as a series of essays in Ambergerís homegrown journal of sword history, "Hammerterz Forum," and it remains unfortunately true to its origins. Amberger more than interests his readers in his subject, yet his haphazard meandering from topic to topic can frustrate those of us who would have preferred more overall focus in the book. The lack of focus, however, is more than made up for by the sheer variety and scope of the work. Within the pages of "SHOTS" one finds unexpected treasures as varied as Ambergerís comparison of ancient Greek pugilism (as found in Homer's Odyssey ) to modern Asian martial systems and his firsthand account of his own "mensur". Likewise, a 17th century English gentleman relates his duel with rapiers, and ancient Romans reappear on the stage as Amberger attempts to reconstruct their fighting system. We may not agree with all his conclusions, but the author never fails, even for a moment, to entertain and enlighten. "SHOTS" greatest value to martial artists of all stripes, however, is Ambergerís study in hopology, that is, combat in its psychological and sociocultural context. Again, Amberger's own life experience serves him in good stead. After reading though Part 2 of "SHOTS" one may indeed question the terminology used by Anglophone martial artists on a daily basis. We may refer to point-sparring as "fighting," but is it indeed proper to refer this activity with the same word we would use to describe two bikers defending their reputations in the parking lot of the local roadhouse, or the countermeasures we might take in self-defense against a knife-armed mugger? How exactly do these situations differ, and how does this affect our performance? As for the rest, "SHOTS" is best described as an appetizer. Reading Amberger's introduction to Western martial history will most likely leave the reader hungry for more technical works by historians such as Egerton Castle and Arthur Wise, and fencing masters such as Luigi Barbasetti, William Gaugler, and Nick Evangelista. 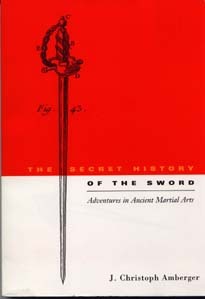 Despite its aforementioned drawbacks, "The Secret History of the Sword" comes highly recommended.